Feng shui is abundant with ways to activate your love and relationship luck in the bedroom. Love luck is symbolized by using pairs of items and objects and various placements. The southwest sector is the love and relationship luck area. If your bedroom isn't in the southwest sector, you can still activate the love luck. Find the southwest corner of your bedroom and use this area to activate your love luck. Add a table lamp, chandelier, or floor lamp in this corner and leave on for a minimum of five hours a day to attract chi energy. Place feng shui love symbols in the southwest corner. The southwest sector is governed by the earth element. You can activate this corner of your bedroom with a few earth element objects. Amethyst: This crystal is believed to contain properties that heal as well as enhance energies such as love. Rose quartz: This crystal is called the love crystal. You can use a natural crystal or a carved/polished rose quartz icon, such as a pair of mandarin ducks (symbol of blessed love union), or pair of carved hearts. Place on a dresser or bedside table. Various pottery and ceramic objects will activate the earth element in the southwest corner of any bedroom. Choose objects, such as a sculpted pair of mandarin ducks or double hearts. There are other symbols of love that you can use in the bedroom. This love enhancing symbol is believed to bring abundance and strong commitment to a relationship. Use a pair of a single peony pictures to further symbolize a couple. This iconic pairing symbolizes the man (dragon) and the woman (phoenix). Use a picture or statue placed in the southwest corner. Red lanterns are a symbol of marriage luck. Newlyweds suspend red lanterns around their bed. You can hang an electric version over a pair of bedside tables. The crane has a long life and a classic symbol of lasting love. Use a pair of paintings of a single crane or a pair of crane figurines. Use a pair of matching nightstands or bedside tables with matching table lamps. Add a matching pair of throw pillows. A pair of chairs placed in the southwest corner can each have a matching side table and table lamp. However, don't place a desk or exercise equipment in the bedroom. These distract from the purpose of a bedroom. You can borrow some basic feng shui rules about beds to help boost the love vibe for your bedroom. The bed should have a strong solid headboard. Don't place the bed directly beneath a window because the chi energy rushing over the bed will cause restless sleep. Always use a bedframe; never sleep on a mattress on the floor. The chi energy is too disruptive. Mirrors: A mirror in the bedroom can be used but should never reflect the bed. Infidelity is believed to creep into the couple's bed when a mirror reflects the bed. Televisions: Most modern homes have a TV directly across from the bed. Some feng shui practitioners advise against having this potential reflective surface. Water and plants: Water and plants are considered too yang to have in a bedroom. This rule should be strictly applied to a master bedroom. If your bedroom is located in the southwest sector, you can take advantage of the colors assigned to this sector. They include, red, pink and white. You can use any combination of these colors. Red: If your bedroom falls into a different sector, use the southwest colors in the southwest colors, such as a pillow, pair of ceramic pieces, throw or accent chair. Pink: Pink may be considered too feminine for a couple's bedroom, but you can use light pink accent colors, such as a pair of pink peony prints. White: White is an easy color to use in a bedroom and will give a crisp fresh appeal. You can add any combination of elements, symbols, and objects to create a haven for revitalizing your love relationship. 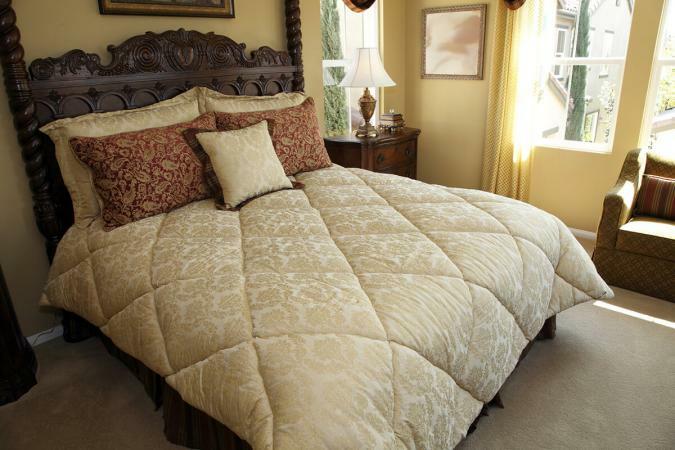 Your love relationship will thrive in a feng shui bedroom that's balanced and harmonious.